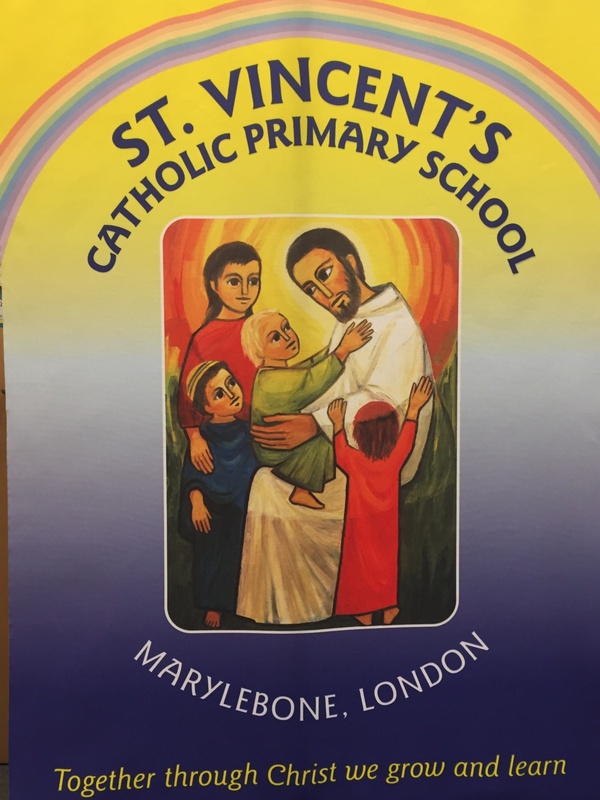 At St Vincent’s we pride ourselves on placing Christ and the teaching of the Church at the centre of our children’s lives to form and develop the inspiration to live their lives fully as Christians. This inspiration was taken from the historical and religious background of our school. The school originates from 1868 when a nursery was opened for the benefit of poor milk women. In July 2005 the Daughters of Charity who founded the school sold the whole convent. The site was bought by Westminster Council and is now under the trusteeship of the Diocese. Through our daily worship, we continue to embed many of the traditions and values that were first established here. We celebrate the role of Saint Vincent himself and the core values with which he continues to provide. All of this allows us form strong links with families, the local parish and the wider community. At St. Vincent’s we will endeavour to educate children through the teachings of Christ, to develop their academic potential to the full and nurture their individual needs within an outstanding school. The Catholic St. Vincent’s family will work together to develop academic, moral, social and spiritual growth for all within the local, national and global community (giving and receiving). We will do this by promoting an ethos of care, support, responsibility and awareness of self and others within a safe, healthy and friendly environment in which we can all inspire and be inspired. 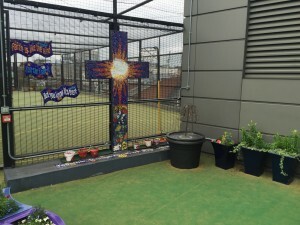 Worship and prayer is at the heart of our school including daily class worship with special worship bags, independent child led worship which is planned and led by pupils, worship activities during lunch in the prayer garden led by our school pupil chaplains. Every day starts and ends with a prayer, and grace is said before meals. Pupils are active and enthusiastic in the preparation of prayers and some have collated their own prayer books which they choose to read from. There are daily acts of collective worship in different forms, including a singing celebration and learners are able to reflect appropriately. Different people plan & lead the assemblies: SLT, teachers, or classes and our termly cultural assemblies also actively involve parents. Visitors are welcomed such as clergy, parents, local police. Learners are enthusiastic about leading class assemblies. Celebrations are often based on Come and See or issues of relevance to the children. Prayer focuses change regularly to reflect the Liturgical year and “Come and See” topics. Mass is celebrated on feast days as well as the start and end of each term. The school chaplain has a good relationship with the pupils. Collective worship makes a good contribution to spiritual and moral development. St Vincent’s Prayer Book contains all the traditional prayers the children are expected to know. This is given as a welcome gift to all new arrivals into the school. The provision is well planned and is monitored and evaluated as part of our annual cycle. Children experience a richness of Catholic tradition of prayer, worship and the celebration of the Eucharist by celebrating whole school Masses at key times throughout the liturgical year. Family Mass occurs once a month at our parish church; teachers, pupils and parents help prepare and take an active part in the Sunday Family Mass with the wider parish community. 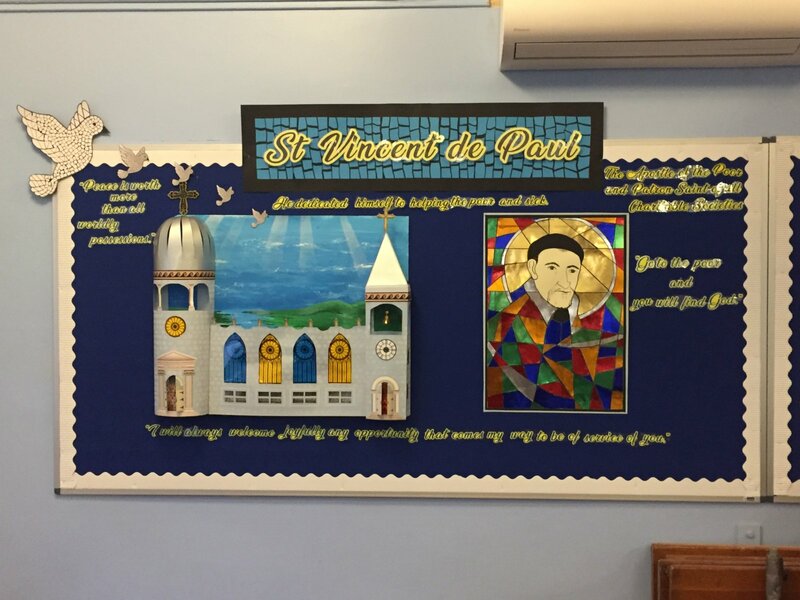 At St Vincent’s we continuously strive to express our Catholic identify, for example creating a whole school religious art project during World Week based on the Beatitudes. Pupils have a deep understanding of the Common Good and are fully aware of what we do within our local, wider and globally community but more important they understand why we do this. Community cohesion is a core value and ethics and cultural diversity are and always has been a rich feature of St Vincent’s. Teachers use pupils of other faiths to support their teaching and to celebrate their religion. This diversity is celebrated further through cultural assemblies. We challenge children to see God’s presence in our neighbours, especially those who are suffering or struggling. We actively engaged in a range of activities to support those in need, such as supporting different charities, Chamber Choir visiting and singing for the elderly, carol singing to raise awareness and funds for the homeless and collecting goods at the Harvest Festival for the Westminster Foodbank. The pupils have a sound understanding of how our fundraising activities helps us answer the call to serve and this is developed through assemblies and lessons. We teach the children to be true to themselves and to see individuality in others e.g. singing at the elderly residents home. School councilors also take an active role in helping their peers understand the call to serve and help others by reporting to pupils on the latest fundraising or community projects. 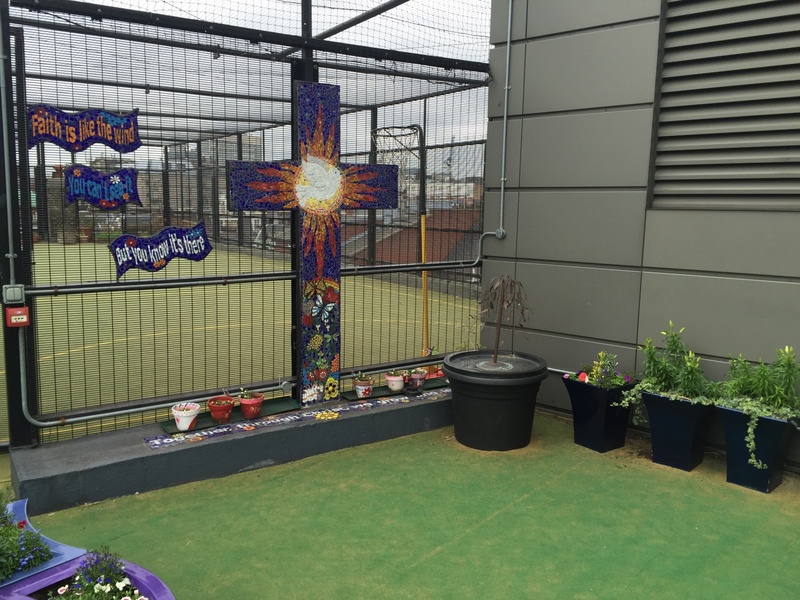 As Religious Education is an integral part of St. Vincent’s the Common Good underpins relationships and behaviors throughout the school and beyond within the wider community. The children are responsible for creating their own rules based upon their faith and their rights as citizens. These growing displays can be found across the school in every classroom. *Pupils have a good understanding and respect for other cultural backgrounds. This is supported by our international link with the Gyanadaya School in Nepal. Both the Religious Education co-ordinator and the MFL co-ordinator visited our partner school to share our faith and learn. 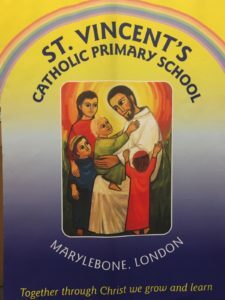 In their return visit to St Vincent’s the children learnt about the vast cultural differences between us and how to respect different faiths and backgrounds. Pupils actively engage in acts of service and have an excellent understanding of why they are doing it. This was evident during World Week where people learnt about the lack of education within our world. Empowered by this knowledge our pupils created awareness of these issues in a variety of ways from organising a sponsored run to creating art work to highlight the key issues. In addition to this our pupils have lots of opportunities for service including Pupil Chaplains, Trust buddies, Green Team, School Council, Playground Patrol, Arts Award and the Wallace Collection Young Curators.